I believe that tai chi is a self-consistent and multi-layered system. By which I mean there are some fundamental building blocks which form a set of non-contradictory principles. These building blocks can be combined together to produce higher level layers which in turn have their own properties. These higher-level layers can then themselves be recombined into even higher layers. To give an analogy from science, let us consider the structure of matter. A physical higher-level object, like a car, can be broken down into components such as wheels, glass, foam padding etc. These materials are made up of molecules (and crystals), which are themselves made up of atoms. Atoms are made up of protons, neutrons and electrons, and these are themselves made up of quarks. And I will stop there. Another object, say a tree, can similarly be broken down, but it is still made up of the same atoms and quarks, just in different quantities and arrangements. Tai chi is slightly different to the above as it is a system of movement, a process, and hence it is not physical. So we could have a tai chi form, which would break down into a series of movements (or postures, although to my mind the word posture lacks the necessary connotations of dynamics) e.g. 'Single whip' or 'Cloud hands'. These movements are themselves built up from a number of characteristics, which in Chinese theory are called the eight methods: Peng (ward off), Lu (diversity), Ji (squeezing), An (pushing down), Cai (plucking), Lie (splitting), Zhou (elbowing), and Kao (bumping). Finally these eight methods are all themselves made up from yin and yang. This is Chinese yin yang theory as it applies to tai chi. The multilayered aspects of tai chi are self-evident to me. The more I practice, the more I "discover" the lower layers and the connections. When doing a movement X, I will suddenly noticed that a part of it is fundamentally the same as another movement Y. In other words, I have suddenly realised that both movement X and Y have a common building block. These small epiphanies are enlightening, and I try to teach students using a similar approach, "...this bit of movement X is just like the bit we did before in movement Y...". Learning tai chi is the process of trying to understand these connections, and normally happens via mini epiphanies, either when your teacher tells you/corrects you, or more powerfully, when you notice for yourself. If you train hard, once in a blue moon you will have a major epiphany. These cannot be learnt, they must be discovered. Your teacher told you for years to "drop your weight as if you're sitting on a chair", and you feel that you are, but one day, you suddenly GET IT and you understand the meaning (at least at the next layer down). You yourself might try to explain it, but are reduced to saying things like "drop your weight as if you're sitting on a chair", as that was really all there was to it. Indeed, this layering, and its connections are really what people who practice tai chi are trying to discover. It is why generally in advanced classes we can often find ourselves standing for prolonged periods, or working on the foundation exercises just as total beginners do. That is contrary to popular perception that in advanced classes students jump around all over the place doing incredibly exotic and complicated movements. That is because in advanced classes although externally we are doing the same movements as beginners, what advanced practitioners are training and trying to understand, is at a deeper layer. An advanced student is really one who knows depth rather than breadth. This is fundamental tai chi training philosophy. Someone who can do one movement perfectly (e.g. standing) can do the entire form perfectly. Why? Because if you understand the deepest level then you understand the building blocks, and which order you put them in is trivial. "It is often said that you only really understand the limitations of your own knowledge when you try to teach someone else. By extension therefore if we take the ultimate "dumb" person, a robot, and metaphorically try to teach it tai chi, we are in fact deepening our own understanding." Therefore, if I cannot teach a a robot (who is anatomically identical to human) to do tai chi, that is a failure of my own understanding, or perhaps even the collective understanding. What I'm looking for therefore is to define and understand the mathematics of these connections. To be able to write them down as formulas, as tables, as processes, as science (something my robot will understand). To return to my structure of matter analogy before, in mediaeval times we had theories of matter, but it was only when the structure of the atom was discovered and matter could be understood in a systematic manner (e.g. the periodic table), that a revolution in understanding took place. The periodic table ushered in this revolution of understanding, because it was able to make testable predictions and identify previously unknown elements. It now provides a structure and a framework to enable discoveries to be made on a daily basis in chemistry, physics and material science that we all rely on every day. Wouldn't it be wonderful if we could achieve a similar thing in tai chi? After all it would be arrogant to assume that everything we (collectively) know now is all there is to know. Searching for a systematic science of tai chi is therefore not a Westerner snubbing Chinese theory, but a researcher searching for a breakthrough. If you could unify the eastern and western sciences of our bodies I think we can all agree that would be the foundation of a healthcare and lifestyle revolution. So to come back down to earth again, what I'm looking for, as a step on the journey, is a way to codify tai chi so that it can be manipulated and reasoned about logically. We need to put a "tai chi mathematics" in place before we can begin to apply it as a science. As with all science, it's best to "stand on the shoulders of giants" if at all possible, so the question is whether there is anything already out there which might be applicable? My initial thoughts on the subject were to look at dance choreography. Is there a system that is used to score a dance routine in a similar way to which you might score a piece of music? 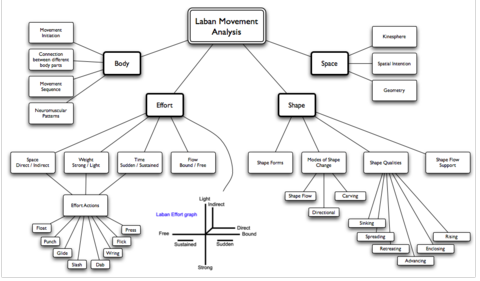 It turns out that there is (but how widely used it is I'm not sure) and it is called Laban Movement Analysis (LMA). The LMA syntax is a language for interpreting, describing, visualizing and notating all ways of human movement. At the top level, Labour described movement using four different categories: body, effort, shape, and space. What I initially find very promising is that the effort category which "is a system for understanding the more subtle characteristics about the way a movement is done with respect to inner intention". Tai chi principles dictates that movement should follow intention, and so having the ability to represent this already built into core system gives me some reassurance that LMA will indeed be suitable. It seems that this technique has yet to be widely applied to tai chi, however I have found a website called movement psychology that has a long description about the linkages between the two. There is a lot to process here and so I will take my time. Although I cannot find any specific conclusions, it appears to be an excellent start to the process of codify tai chi systematically. The next step now then is to try to characterise a very simple movement sequence and see what it looks like... watch this space! Thanks for those really great links Konzept! Oh boy do I have to make a sequence like this for tai chi :-) Check out this excellent star wars yoga set !